Storing flammables inside of a factory can be dangerous and risky if the proper container is not used. Making sure that your flammables are completely compliant and safe is the main priority. Hazardous liquids require special attention and must be handled extra carefully. The National Fire Protection Agency (NFPA) and the Interntaional Code Council (ICC) control requirements and classifications for the safe storage of flammable materials when using flammable storage lockers. A flammable liquid is any liquid that has a flashpoint at or below 199.4°F, 93°C. Flammable Storage Lockers offer complete protection and compliance for storing flammables inside your facility. US Chemical Storage flammable storage lockers are designed by professional engineers to ensure ultimate safety and compliance. Our flammable storage lockers provide superior strength and durability when storing flammable materials and hazardous materials. 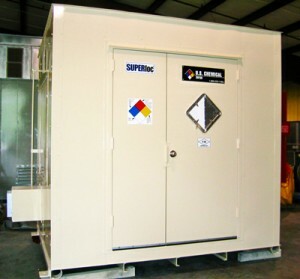 When operations require flammables to be stored inside the manufacturing plant or facility a SUPERLoc chemical storage building is the perfect solution. Flammable storage lockers allow for increased operational efficiency by keeping your inventory inside your facility. Our SUPERLoc series flammable storage locker structural framework conforms to NFPA 30 standards and exceeds EPA and OSHA regulations. Our strongest storage building, the SUPERLoc, is designed for 4-hour fire rated capabilities to keep your operations safe and compliant. Superior design and manufactured from heavy gauge steel with a leak-proof built-in secondary containment sump for complete safety for your facility. Our fire-rated buildings, FIRELoc and SUPERLoc can be manufactured with FM or Warnock Hersey Approval. Choose from our wide variety of customizable accessories to keep your flammable storage locker 100% compliant. Explosion relief construction, and other explosion proof accessories allow for Class 1A flammable chemical storage and/or mixing of Class 1B flammable chemicals. The SUPERLoc flammable storage locker by US Chemical Storage is trusted nationwide and is the perfect choice for storing flammables and combustibles when a fire rating is necessary.